Blogger automatically tracks the amount of traffic to blogs like this one. MinerBumping began just shy of six months ago, in early August 2012. In that time, 393,000 hits have been registered. It's becoming more popular all the time--we have the momentum of a runaway freight train! 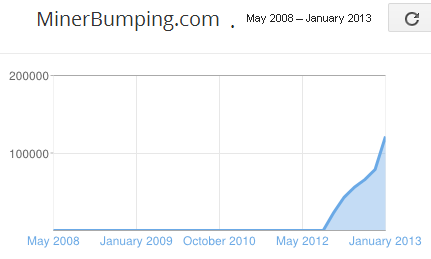 The Blogger chart above shows not the cumulative total, but the monthly rate of hits. It's on an upward trajectory because there has been an increase in activity each month. In January alone, MinerBumping received more than 120,000 hits. In terms of daily traffic, we stand head and shoulders above nearly all the other EVE blogs, and we're just getting warmed up! This is an important development not only because it puts a metric on how awesome I am, but because it points to the growth of the New Order's influence. Some people--especially those who were hoping we'd just go away from Day One--find this alarming. But there is absolutely no reason to fear our rise to power. These changes are perfectly natural. We're taking over highsec. Why do so many people come to this website? I believe it's because there's a real hunger out there for something very few people offer these days--the truth. So often, people say whatever it is they assume everyone else wants to hear. But I have pledged to speak the truth to the EVE community, even when it's not the popular thing to do. I tell the truth because I care so deeply for each and every one of you. As we go about our work of shifting highsec from a state of anarchy toward a more Code-centric, James 315-centric model, MinerBumping's influence will continue its steady growth. Ideally, everyone in EVE will visit this blog at least once per day, just in case I have something important to say. Ultimately, the credit for the increase in MinerBumping traffic goes to you, the reader, for the wisdom and discernment you exercise when you choose to come here. Congratulations! I personally visit this site multiple times per day to keep up with the rabid dedication with which James updates this blog - twice a day like clockwork. I was really considering pointing this out on one of the supporter ranking posts, but in the comment section of this post is an even better place to point this out: Content generation in this game is one of the most thankless and least fiscally rewarding professions you can choose for yourself. The unsung fleet commanders, pos managers and diplomats hidden behind the curtain toil countless hours and pour their blood and sweat into this game to grease the cogs of countless others' play time. The isk contributions provided by the minerbumping community are really an investment in one of the greatest content generators this game has ever seen: James 315, the man, the myth, the legend. On behalf of the entire Eve community, I thank you. Keep up the good work! YAY FOR NEW AND INTERESTING CONTENT! This paragraph is a solid 12 on a scale of 1 to 10 for awesome. One of the best EVE related sites around. Whether you are pro-bumping or not, it's undeniably content. just because more people are visiting doesn't mean you have more supporters. i come here to laugh at the nonsense. my vote in the CSM election will be for your competition. best of luck on your silly crusade.